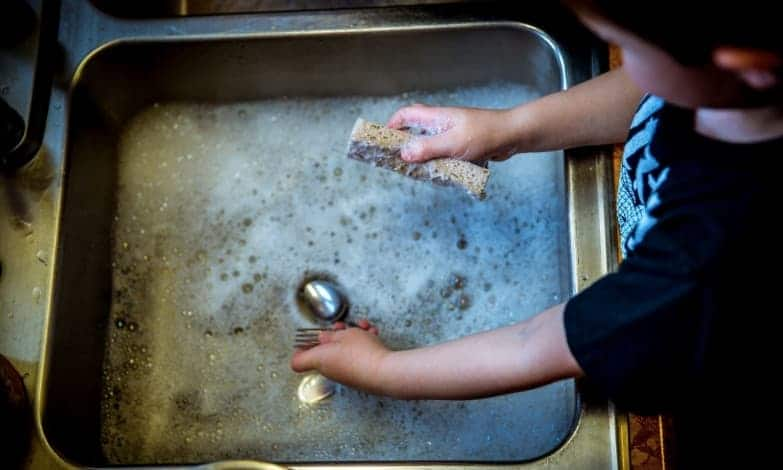 Unless you are one of the lucky ones, you likely have a hard time getting your children to help out with the kids chores assigned to them around the house. What if I told you that there were ways to motivate your child to help with the housework, rather than having to force them into doing it? Well, you came to the right place. In this post, you will find six way’s to get your children excited about housework. At the very least, it will make them hate chores a little less. This works well with smaller children. Put on some favorite silly tunes, and let them dance around the rooms while they clean. Children can wiggle away while they help mom or dad unload the dishwasher, wipe down cabinets or appliances, put away toys, or just about any other chore you can think of. Another option is to have a singing contest while they clean. Each child has a task to do and their chance to sing is while they complete their task. If they don’t complete their task or do it correctly, they lose points. Feel free to come up with your own method of this game as well for what works best with your children. Instead of just telling your children what chores you want them to complete, you can use a chore chart. Make your own, or find one that is existing. I recommend creating your own with the help of your children so that you can make it colorful and playful. This will keep your child’s attention much better than a plain chart from the internet. You can put the chart on the fridge, and use magnets to mark whether the chore has been completed for the day or not. You can create a reward system with this method as well. For example, if your child completes their chores every night during the week, they get ice cream or a treat on the weekend. Children get bored and lose interest very easily. To prevent this, you can switch up the chores from child to child so that each child does not feel they are doing the same thing every day, or getting the “worse chore” than the other child (can you tell I have heard this before?). You can also designate certain chores to be done on a rotating schedule so that your children are doing different chores on a day-to-day or week-to-week basis. Make them feel like they are contributing to something important when discussing kids chores. When they finish a chore such as folding the laundry, cheer for them, or give big thank-you hugs! When they help you vacuum, give high-fives and tell them how much they have helped you. Children like feeling important and helpful. When you show them praise or include them in things, it gives them a sense of purpose and encourages them to continue helping. Using popsicle sticks, you can put together a little jar with different chores that need to be completed. At chore time, let your children pull some popsicle sticks out of the jar. You can color code these if you want for different rooms or chore types. This will make it more fun and let the children have a little more control in their chores. You can allow them to exchange chores if both children agree. This works best for older children especially. Create a list where each chore or task is worth a certain amount of money. For example, taking out the trash can be worth $1, while sweeping the kitchen floor can be worth $2. Washing the car, now that’s worth $5-$10. You can adjust this accordingly to your budget and your children’s age. This is a great way to get your kids to do chores as well as teaching them about money and how hard work is rewarded. When your children ask for money, you can direct them to the list where they can earn the money they need. You just read the six ways you can motivate your children to help with kids chores. Just remember to maintain a steady routine and stay consistent, and I guarantee that at least one of these methods will be helpful in your families chore routine.